Ted Hamann is selected for the first Spotlight Award from Lincoln Education Association. 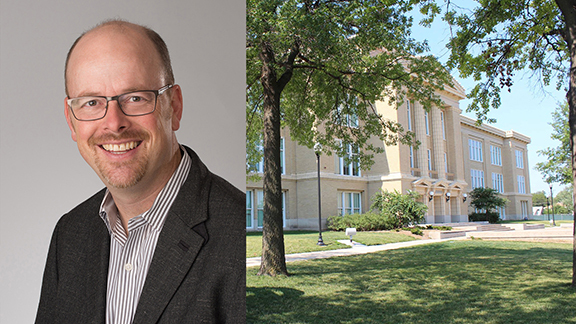 Ted Hamann, professor of teaching, learning and teacher education in the College of Education and Human Sciences, will be awarded with the first ever Spotlight Award from the Lincoln Education Association at a May 17 recognition event in Lincoln. LEA is the Lincoln affiliate of the Nebraska State Education Association. Hamann was nominated by members of LEA for his role in the successful nomination of Lincoln High School for a Schools of Opportunity Award from the National Education Policy Center (NEPC) at the University of Colorado Boulder. Hamann and his TLTE graduate students volunteered to research and draft the Schools of Opportunity nomination because Lincoln High didn’t have the time and personnel to devote to the project. LHS Principal Mark Larson and his team approved the application and it was submitted with the blessing of the school community. The Schools of Opportunity program celebrates public high schools that narrow opportunity gaps and succeed with diverse student bodies. Lincoln High features multiple ethnicities, economic and cultural backgrounds. Hamann, describes it as a cross-section of the world representing at least five continents. The teachers, staff and administration of LHS have created a welcoming environment for all students, said Hamann, and he wanted to support their work. Students from Hamann’s “Effecting High School Improvement” class engaged in a project where they could see the different elements that are required to provide a school environment where all students can succeed. The project was a “win-win” partnership for Lincoln High and Hamann’s students. More information about Lincoln High’s Schools of Opportunity Award is available at http://nepc.colorado.edu/newsletter/2018/01/eight-public and a May 16, 2018 Washington Post article also features the school's award.